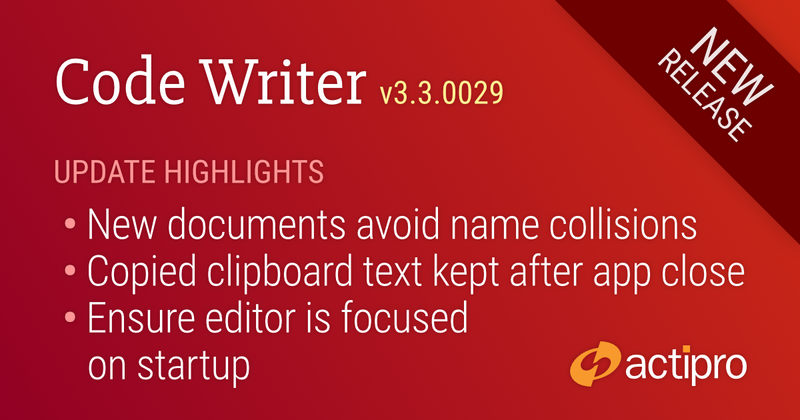 Code Writer v3.3 was just published to the Microsoft Store and should be available shortly. Added: New documents will avoid name collisions with existing open documents. Added: Support for opening ColdFusion files from Windows' Open With menu. Added: Support for opening .config and .rst files from Windows' Open With menu. Added: Copied clipboard text is kept on the clipboard after app exit. Changed: Delimiter highlight background to improve visibility. Fixed: Focus was not in the editor at app startup. Fixed: Consolas was not selected as the default font for new installs. Code Writer is a free text and code editing app, downloadable from the Microsoft Store, and is used by thousands of people each day. Version 3.x requires the Windows 10 Fall Creators Update (version 1709) or later. Code Writer is a free text and code editor app with over 20 supported file types. Use it as a replacement for Notepad and other quick edit apps.